Comfortable 3 1/2 Zi. Apartment (about 70 square meters) on the ground floor of the 5 family chalet Sunnegg on the Upper Glacier Road in Grindelwald for 4 to max. 6 persons. Quiet, slightly elevated position, patio, beautiful view, house accessible by stairs. 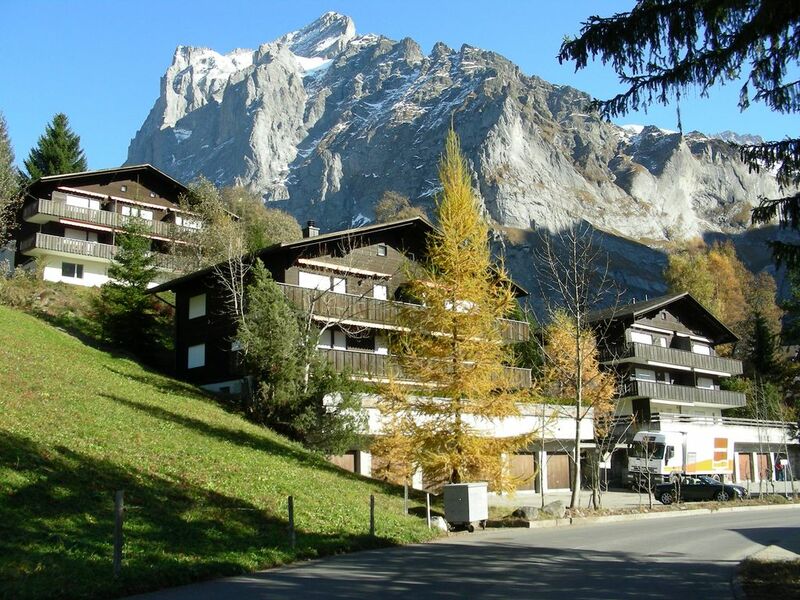 The apartment is located in a quiet, sunny location outside the village center Grindelwald in the direction of Grosse Scheidegg, 2 minutes walk to the ski bus, 4 minutes to the bus. The ski-downhill slope (First) 200m from the house. The apartment was extensively renovated in 2017 and refurnished. Living room with dining table, upholstery with sofa bed, TV / radio, free Wi-Fi. Fully equipped kitchen with electric stove and oven, dishwasher, etc. Large corridor with wardrobe and cupboard. 2 bedrooms each with 2 beds, bathroom with bath / shower, sink and toilet. Eiger. We usually ate both breakfast and dinner out there. Good location to begin walks. We frequently began daily walks up to station Bort. Easy walk to town and to a couple of good restaurants in the other direction. We spent three weeks and plan on going back. Sonnegg and Grindelwald are magical. i defenetly recomend this home. Fabulously clean and modern in stunning location. The owners, Stefan and Barbara were helpful and responded quickly to any questions I had. Thank you. We had a wonderful stay in this lovely apartment. The apartment (or house) has everything you could wish for, from the washing machine to the state-of-the-art TV. It was spacious, newly furnished, and very comfortable. And it is in a beautiful location: right next door starts a meadow that smells of freshly mown grass; from the living room window front you see right onto the Oberer Gletscher. We were glad to be able to use the designated parking lot. I had a wonderful experience in this lovely chalet with an amazing view. The owners recently refurbished the entire apartment with all new furnishings, kitchenware, new carpet, new paint etc. Effectively it was brand new! It was quiet the bed was very comfortable and the bathroom I had a very large and deep bathtub, which was great after a long day of hiking. Very quiet and a short distance into town and the COOP. The deck and retractable sunshade made for very comfortable outdoor living in as well. We travel to Europe several times a year and use Airbnb or HomeAway exclusively and in our travels have never found a place as nicely appointed as this one, especially for the price point. Public bus transport to the city and surrounding area is short walk just out front. However there is a private parking place provided. The owners, a brother and sister team were super easy to work with and were accessible and great to work with. I would gladly rent there again and recommend it to all travelers. Please note there are several stairs to get to the apartment which may not be well-suited for the elderly. Ich hatte eine wundervolle Erfahrung in diesem schönen Chalet mit einer herrlichen Aussicht. Die Besitzer haben vor kurzem die gesamte Wohnung mit allen neuen Möbeln, Geschirr, neuen Teppich, neue Farbe usw. renoviert. Wirklich war es ganz neu! Es war ruhig das Bett war sehr bequem und das Badezimmer hatte ich eine sehr große und tiefe Badewanne, was toll war nach einem langen Tag beim Wandern. Sehr ruhig und eine kurze Entfernung in die Stadt und die COOP. Das Deck und der versenkbare Sonnenschirm sorgen für einen sehr komfortablen Aufenthalt im Freien. Wir reisen mehrmals im Jahr nach Europa und nutzen Airbnb oder HomeAway exklusiv und auf unseren Reisen haben wir nie einen so gut ausgestatteten Platz gefunden, besonders für den Preis. Der öffentliche Busverkehr in die Stadt und die Umgebung ist nur einen kurzen Spaziergang entfernt. Es ist jedoch ein privater Parkplatz vorhanden. Die Besitzer, ein Bruder- und Schwesterteam, waren super einfach zu arbeiten und waren zugänglich und großartig, um damit zu arbeiten. Ich würde gerne wieder dort mieten und es allen Reisenden empfehlen. Bitte beachten Sie, dass mehrere Treppen zum Apartment führen, die für ältere Menschen möglicherweise nicht geeignet sind. Die Ferienwohnung ist sehr schön! Sie ist super ausgestattet, tolle Lage. Wir haben uns sehr wohl gefühlt!